OpenIMS DMS for Sugar SugarCRM, Inc.
OpenIMS DMS is a webbased document management system which integrates seamlessly with Sugar and therefor add's many DMS features to Sugar. All major DMS functionality is available from within Sugar panels related to customers, contacts, cases and other modules. From within Sugar new documents can be created based upon templates provided by OpenIMS DMS with integrated metadata from Sugar s.a. company name, address en contact information. The document history overview shows all versions of a certain document and different versions can be compared (visually). OpenIMS DMS is a server-side solution. Templates, metadata, documents are all stored in the central repository of the OpenIMS server. That makes it an easy to manage and powerful document management solution. 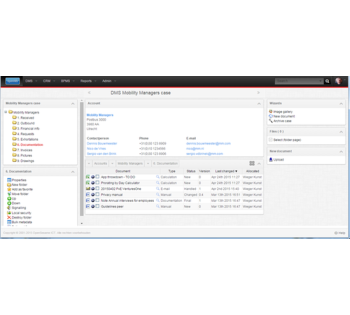 The server component can be installed on premise, but you can also use OpenIMS DMS as a fully managed cloud service. Include DocuSign digital signatures in your OpenIMS DMS (generated) documents to start a digital transaction straight from Sugar. No more printing, signing, scanning and e-mailing to get your documents signed. Just a simple click on a link to launch a digital signature transaction on the trusted DocuSign platform. With the integrated HTML5 viewer you can view and annotate any document on any device, including Word, Excel, PowerPoint, PDF, OpenOffice, AutoCAD, JPG, PNG, TIFF, GIF and more. With this function a user can upload (drag and drop) multiple documents to Sugar. Support desk is available during workdays (mon - fri) from 08.30 - 18.00 hours GMT. Service Level Agreements are available upon request.